Matakana SuperFoods is bringing its Acai Bowls, Supergreens, Supershakes and Superchoc shake mixes, as well as its vegan, gluten-free SuperFood Dark Chocolate Bars to the world’s largest retailer, Amazon.com. 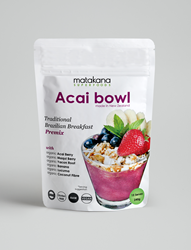 The Acai Bowl and Supergreens are the most popular products among Matakana SuperFoods' top sellers. We offer the tastiest premix of freeze-dried berries for an acai smoothie, bowl or dessert. This nutrient-dense food is packed with antioxidants, Omega fatty acids and other nutrients that improve digestive health and immunity. Amazon.com will receive seven items in total from the line of more than 70 superfood products Matakana produces. Matakana SuperFoods products supplement diet, providing a daily boost of vitamins, minerals and phytonutrients. Glucina founded Matakana in 2009 with a philosophy that super-nutrient wholefoods are key to a healthy diet. Matakana SuperFoods continues to produce unique foods and mixes that taste great, distributing in New Zealand and abroad. The more than 70 lines of Matakana SuperFoods products include chia seeds, maqui, goji and acai berries, coconut sugar and fermented coconut sauces, and its Supergreens and Supershake blends. These superfood products are sourced from organic and sustainable farms. The Acai Bowl and Supergreens are the most popular products among these top-sellers, and the vegan, gluten-free SuperFood Dark Chocolate Bars with organic maqui berries, sacha inchi and cacao nibs are sure to impress. For more information on Matakana SuperFoods and its various superfood products, visit http://www.matakanasuperfoods.com, or look for them soon on http://www.amazon.com.